Backlink credits determine the number of Link Research reports and Link Tracking that can be run each month. Each individual backlink that is returned in a Link Research report or Link Tracking Update counts as one credit. Since it cannot be known how many backlinks a report will return before it is run, Dragon Metrics allows users to limit the number of results returned by a report to give users more control over their credits. If a limit is specified, Dragon Metrics will not use more credits for the report than what the limit was set to. Backlink credits are refreshed on the first of each month back to their original amount. This means that if an account runs out of backlink credits on the 20th of the month, they will need to wait until the first of the next month before they can run additional reports. Backlink credits are not cumulative, so if you do not use all of your quota for the month, they do not "roll over" to the next month. Your account will only be replenished with the number of credits used that month. Account Details page allow you to get all the usage data in your account, including Backlink Credits, to get to the Account Details page, click on the gear icon on the top bar and select Account Details. 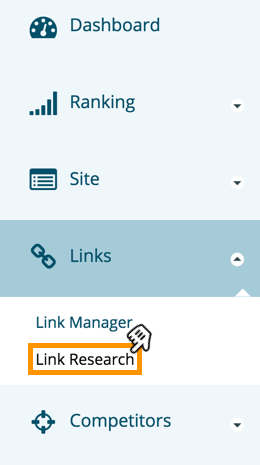 When you are doing Link Research, the remaining Backlink Credits will be shown as well.